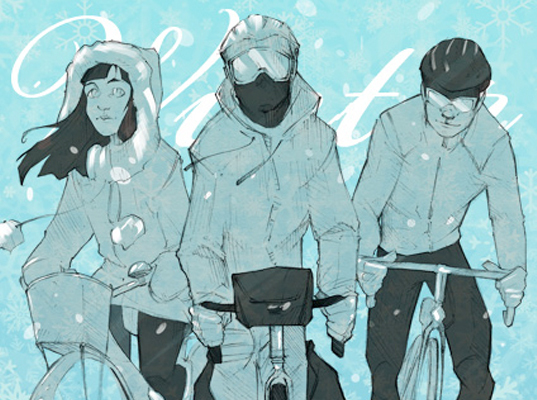 Some might think it crazy to travel by bike in the winter, but it’s actually quite possible if you pack correctly and stay smart while out on the road. Today I want to share with you how I have packed for my winter bike tour in Europe. I’ll show you everything I brought with me and explain why I brought these particular items. A note should be made that this is not how you pack for a “traditional bicycle tour”. If you are looking for a more traditional packing list, please check out my article, “How To Pack Your Panniers“. I’m planning to be in Europe for about five months, so I have to warm you, I’ve got a lot of stuff! And even through I’m carrying three jackets, four pairs of pants and an arsenal of items I’ve never had to bring on any of my previous bicycle adventures, almost everything I’ve brought with me fits inside my four Ortlieb panniers. Bicycle – Every bicycle tour starts with a bike. For me, the bike is a Bike Friday New World Tourist. It’s a folding bike made by Green Gear Cycling Inc. of Eugene, Oregon and it’s the same bike I used just a couple months ago when I traveled to Aruba. While it’s probably not the best bike for navigating around in the snow, my main reason for bringing it was so I could avoid the hefty fees that are currently being levied on travelers flying with a bicycle. By bringing my Bike Friday, I avoided paying $300 worth of fees by simply using this bicycle and packing it inside a cardboard box that was under the airline’s regular size restrictions. I plan to do a more detailed review of the Bike Friday New World Tourist after I’ve spent some time riding it here in Europe, but so far, the bike has been just great (even if I do get a few odd looks every once and a while). Rear Light – I have a large rear light on the back of my bike. I don’t know what kind it is and I’m not sure it really matters. The important thing is that I have a light! And you should too! Don’t leave home without a rear light for your bike. Fenders – I didn’t really need fenders for my trip to Aruba, but here in Europe where every single day requires me to ride through water, ice and snow, fenders are important. I bought a cheap pair of 20 inch Planet Bike fenders on Amazon.com and they work great! Front & Rear Rack – To hold my panniers on the bike, I’m using the rear folding rack Bike Friday recommended I purchase when I got my bicycle from them… and I’m using the AC Lowrider Front Rack from my full-size touring bike for the rack on the front of my bike. Panniers – For this trip I’m using a set of Ortlieb Bike Packer & Sport Packer Plus panniers. These panniers are waterproof and the “Plus” means that they do not have that shiny “medical sheen” you see on the “classic” Ortlieb products. Again, I’ll do a more in-depth review of these panniers after I’ve been on the road for a while and have more experience with them. But from what I’ve seen thus far, they are very much like my old Lone Peak panniers. The main difference at this point is that the Ortlieb’s, while being waterproof, lack the extra pockets found on the Lone Peak packs. Helmet – I forgot to mention it in the video above, but I do have a helmet with me. I’m using a Giro Xen bike helmet with a Matte Olive Fade to match my olive green snow pants. Snow Jacket – Nothing special here. The waterproof jacket I’m wearing to both walk around in and ride my bike in is a black Burton snowboarding jacket. I’m not sure of the exact model number. It cost about $200 USD. Lightweight Jacket – The lighter jacket I’m wearing underneath the Burton snowboarding jacket is a black Hurley jacket I found at my local mall for about $70 USD. Again, I’m not sure of the model number or type. Jersey – When on my bike, I’m wearing a lightweight Fox Racing jersey. The jersey is not warm at all, but it does allow my skin to breathe and helps to wick away the sweat from my body. Apparently, this jersey is no longer available through the Fox website. Watch – I haven’t had a watch in years. After my wrist watch broke shortly after graduating from high school, I never bothered to replace it. Instead, I relied on my cell phone to tell me what time it was and to act as my morning alarm. But for this trip to Europe, I left my cell phone at home (it doesn’t work in Europe and I didn’t want to pay the extra fees associated with making it work over here). For that reason, I realized I needed to get a watch (so I would know what time it was when I was out on my bike or traveling around). I wanted a watch that came with an alarm, but couldn’t find one I liked, so I opted for a black metal watch from DKNY simply for the style and color. It tells me the time and that’s all it does. Road ID – On my other wrist I’m wearing a Road ID safety bracelet. The Road ID is a product I’ve discussed in the past, but it’s basically a medical ID that you wear in the case of an accident while out on the road or traveling. Because I’m in a foreign country and traveling by myself, I feel just a little safer knowing that if something were to happen to me, the people who found me would at least know who I was and whom they should contact. Ski Pants – I brought a pair of ski pants for two reasons. The first is that I hope to do some skiing at some point while I’m here in Switzerland or Austria. The second is that I’m riding my bike in the snow… and I’m actually riding the bike in these waterproof ski pants. The pair I’m using is an excellent pair of olive green Patagonia ski pants I obtained for about $100 from my favorite outdoor outlet – Cheap Sports, in Ventura, California. Bicycle Shoes – To keep my feet both warm and dry while out on the bike, I chose a pair of Shimano MP66L bicycle shoes. These shoes have the cleat on the bottom so you can clip into your pedals, but they also look like regular walking shoes, so when I wear them off the bike I don’t immediately stand out as a “biker”. They’re also very comfortable and feature a Velcro flap that extends over the laces to keep water, wind and snow from getting to my feet. Ski Gloves – Keeping with the cold weather ski theme, I brought a pair of full-fingered Dakine ski gloves. When on the bike, these are the gloves I’m wearing. Your normal summer bike gloves just wouldn’t cut it in these sorts of weather conditions. Ski Goggles – Both for skiing and for my time on the bike, I’ve got a pair of Scott ski goggles. I’m not wearing these on the bike all the time, but when the weather gets bad, they’re the first thing I throw on to keep my face warm and the snow out of my eyes. Pant Leg Protectors – Because I’m riding in long pants, I’ve had to do something to keep my pant legs from getting caught in my chain. To keep this from happening, I’m using a Deuter Pant Leg Protector on the right side of my bike (where the chain is) and a makeshift pant leg protector on the left side of my bike if necessary (the pant leg on my jeans get caught on both the right and left side of the bike. Ugh!). Water Bottles – Even through it’s freezing outside, you gotta continue to get some fluids into your body. I’m using a pair of Fox Racing water bottles to carry my water. I got them for $5.00 USD each at my local bike shop. Tent – Even though I’m staying in apartments for much of my time in Europe, I do have a number of nights where I will be traveling from one location to the next and have not secured places to stay for these nights. For this reason, I wanted to have the option of camping if necessary. I’m doing this trip on a budget, so paying for a hotel every night is not an option. The 2-Person MSR Zoid tent that I’ve brought with me will allow me to camp if I so choose. Toiletry Kit – I like to keep all my toiletry items together so that when I take a shower or use the restroom it’s easy to find what I need. To do this, I use an Eagle Creek Wallaby Toiletry Kit. Inside the kit I keep all the obvious things, such as: a toothbrush, toothpaste, dental floss, nail clippers, tweezers, a pack towel, deodorant, shampoo, face wash, etc. Geocaching Trinkets – When I was in college I came across something called Geocaching. It’s one of those things that is a little difficult to explain to someone who has never done it before, but according to the official Geocaching website “Geocaching is a high-tech treasure hunting game played throughout the world by adventure seekers equipped with GPS devices. The basic idea is to locate hidden containers, called geocaches, outdoors and then share your experiences online. Geocaching is enjoyed by people from all age groups, with a strong sense of community and support for the environment.” As a part of the game, you can take objects out of the geocaches that you find as long as you leave something in its place. I’ve brought a couple trinkets/treasures with me so that when/if I find a geocache, I can leave something behind for Geocachers coming after me. If you’ve never gone Geocaching, get a GPS or find a friend who has one and give it a try! T-Shirts – I brought four different T-Shirts with me on this trip. One shirt is a work out shirt for running or biking in and the other three are to simply wear when I’m walking around town or hanging out in my apartment. Sweat Pants – At night I sleep in a pair of lightweight Nike sweat pants. They aren’t your traditional sweat pant, but instead, more like something you should see a basketball player wearing over his shorts during warm up. They’re lightweight, warm and (somewhat) stylish. Long Sleeve T-Shirt – I’ve also packed a single long sleeve T-shirt. Most of the time I just use this shirt to sleep in, but if I absolutely had to I could ride in it as well. Jeans – Because I’m spending so much time on this trip living a “normal” existence, I’ve packed two pairs of jeans. These are the pants I wear on a daily basis both in my apartment and exploring the city on foot. Almost everyone here is wearing jeans, so I fit right in! Sunglasses & Case – I’ve mentioned in previous articles that I’m not a big fan of sunglasses. But even though I don’t like wearing sunglasses, I will wear them if I need to. At certain times, I do realize that sunglasses are vital to protecting your eyes from the sun, the cold, and/or the elements. Because of this, I have a cheap pair of sunglasses and protect them inside my panniers by packing them inside a lightweight zippered sunglasses case like this one here. Mini Flashlight – I’m not sure I needed to bring a mini flashlight, but my parents bought it for me as a gift just a few days before leaving on my trip and felt I should bring it for them, if not for anything else. I’m using it at night as a reading light and as a way of checking the time in the middle of the night (as my watch does not light up). Bicycle Mirror – I actually brought two bicycle mirrors with me on this trip, but most people won’t need to do this. I brought my trusty CycleAware Reflex mirror and I brought the small, stealth-like ViewPoint mirror (also from CycleAware). First and foremost, I packed a mirror because I wanted to be able to see cars approaching me from behind, but I brought two mirrors simply because I wanted to spend some more time playing around with the ViewPoint mirror. Bringing the Reflex mirror was a no-brainer, but I brought the ViewPoint because it’s incredible small and wouldn’t take up a lot of space… and because I simply wanted to experiment some more with it while I was on this trip. Knife – I’ve brought a knife with me on every bicycle trip I’ve ever taken. I bring it for self-protection, but I mainly use it to cut up my food. On this trip I’m using a Kabar Folding Knife. Patch Kit – In the event that you get a flat tire, it’s a good idea to have a patch kit on hand. But more important than having a patch kit is knowing how to use it. Tire Levers – Inside my patch kit are two tire levers. Often times, tire levers come in sets of three, but I’ve found that two are all you really need. Bungee Cord – Also packed inside my patch kit is a tiny little bungee cord which I use to strap my tent to the back of my bike. The bungee is so small that it won’t stretch to hold down anything extra, so if you have more stuff to carry on the back of your bike, you’ll need a bigger bungee cord. Spork – In addition to the knife I’m carrying to cut my food, I’m also traveling with a lightweight spork. I’ve brought this along just in case the apartments I rent along the way don’t have utensils or if, when traveling on the bike, I want to eat something that requires a spoon or fork. I’m using the Sea To Summit Titanium Spork I reviewed here. Cable Lock & Key – To ensure my bicycle does not get stolen, I’ve brought a keyed cable lock. To read more about how to lock up your bike and which types of locks I prefer, please read my article on “Locking Up Your Bike“. The key to the lock is attached to a lanyard which is then attached to my snowboarding jacket. This way, my lock is always on me and I have no chance of losing it or misplacing it inside my panniers. Pedal Wrench – On most days there is little need to adjust or remove my pedals from the bike. But there are two significant times on a bicycle tour in which putting on or removing the pedals is key – the start and the end of your tour. To get the pedals on and off my bike at these two points in the tour, I bring along a lightweight pedal wrench. Finding a wrench when out on the road can be, at times, difficult or impossible. So having the wrench with you is fantastic when the time finally comes to use it. Multi-Tool – Anyone traveling by bike needs to have a good multi-tool. The multi-tool should contain all the allen wrenches and screw drivers needed to make adjustments to your bike. Check to make sure your multi-tool has everything you will need for your journey before you leave home. Pump – To keep my tires at the proper pressure, I’m using a Topeak Harpoon Master Blaster bicycle pump. It’s larger than a lot of other bicycle pumps on the market, but it’s extremely durable and I don’t have to worry about it breaking inside my panniers while out on the road (something that has happened with other bike pumps I’ve used in the past). Waterproof Bag – I’ve got a lot of electronic devices with me on this trip. To keep some of the smaller electronics safe and dry, I’m using a small Sea To Summit waterproof bag to store these important electrical possessions. Water and electronics don’t mix, so the waterproof bag inside my waterproof panniers simply add an extra layer of protection to my things. External Hard Drive – I’m taking a lot of photos and recording a ton of video on this tour. My laptop computer (which I am also traveling with) comes with a 180 GB hard drive, but it’s simply not enough. So instead of purchasing another computer with a larger hard drive, I bought a small external hard drive which connects to my computer via USB. The hard drive I’m using is a 500GB Western Digital My Passport Essential. As I mention in the video above, the best thing about this hard drive is that it does not require an additional power source like so many other external hard drives do. Instead, the drive simply pulls a charge from your computer through the USB. This one little features is huge for anyone traveling around the world, because having two electronic devices to plug into the wall would, under normal circumstances, require two different power converters. But with this hard drive, I only need the one power converter for my computer and can travel that much lighter because I don’t need two power converters for my multiple electronic devices. USB Memory Stick – In addition to the external hard drive, I’m also carrying a small PNY 8 GB USB Memory Stick. I probably don’t really need this when I’m carrying both my computer and the external hard drive, but I brought it just in case. I use it to store and back up really important documents and I use it to shuttle files from my computer to public computers for printing… or vice versa. Battery Charger & Rechargeable Batteries – The rear light on my bicycle light uses two AA batteries. Because of this, I’ve brought 4 AA rechargeable batteries (2 inside the light and 2 as a backup) and a (European) battery charger. I could just buy new batteries along the way and save a little weight on my bike, but I’d rather save the money I’d spend on new batteries and do what I can to recycle, reduce, and resuse. Walking Shoes – On all but one of my bicycle tours in the past I’ve brought just a single pair of shoes. I had one pair of shoes to ride in and the same pair of shoes to walk around in. But on this trip I brought a second pair of walking shoes for two main reasons. The first reason for bringing a pair of walking shoes is because I knew I planned to do a lot of walking on this trip. I made sure the shoes I selected were slightly waterproof too, as I knew I would be walking in cold, ice, and snow. The second reason for bringing a pair of walking shoes is that after cycling all day in my Shimano riding shoes, I wanted to have a clean, dry pair of shoes that I could slip into. I have big feet (Size 12 US) so bringing a second pair of shoes takes up almost an entire pannier, but it’s worth it once you realize that this isn’t just some week long trip. I’m here for five months and I want to be comfortable! Socks – Keeping your feet warm in cold weather is vital. Shoes play an important part in this, but socks may be even more important. For this reason, I’ve brought three pairs of heavy winter socks, a couple pairs of dress-type socks, and a few more pairs of anklet-type socks you might wear with shorts in the summer time. In total, I have 8 pairs of socks, which is a bit too many (I now realize). I’ll likely end up ditching some of the dress and anklet socks and narrowing the 8 pairs I have now down to 4 or 5. Underwear – I didn’t mention this in the video, but I did bring underwear as well. A number of pairs. Don’t forget to pack some underwear! Arm Warmers – To keep my arms warm when I’m on the bike, I’m using a pair of Pearl Izumi arm warmers. I haven’t used these yet, but I did use them on my last trip through Europe, so I thought I’d bring them along this time as well. I’ll probably wear them once April and May roll around and my heavy snowboarding jacket comes off. Chain Lube – To keep my chain lubricated, I’ve got a small bottle of winter chain lube. Ask your local bike shop to recommend a chain lube for the riding conditions you think you will be in on your tour. In my case, this stuff is made to get wet! Belt – I want to fit in when traveling on this trip, so wearing a belt is essential. Not only does wearing a belt help me blend in with the rest of society, but it also helps to keep my pants up! I don’t really need the belt at the beginning of the tour, but I bet that by the end I will have lost a significant amount of weight and that belt will certainly come in handy. Face Mask – The face mask I’m using on this trip is literally saving my life when I’m out on the bike. If it were not for the face mask, I could never cover the distances that I am covering on this tour. It’s simply too cold to be out on the bike for any significant amount of time without a face mask. There are a number of great face masks to choose from, but I’m using a Seirus Innovation Comfort Masque (which is the same mask I ski in during the winter). Beanie – In addition to the face mask, I’ve also packed a simple black beanie to keep my head warm. I wear this off the bike more than on it. Long Underwear Bottoms – To keep my bottom half warm, I’ve packed a small, thin pair of black Duofold thermal underwear. They pack down to an incredibly small size, but they’re not made for cycling and the pair I have might be a tad bit too small. Money – Unfortunately, you gotta bring some money on your bicycle adventures. I wish you didn’t, but you do! On this trip, I have US Dollars, Euros, Swiss Francs, and even a few Polish Zloty (left over from my previous trip to Europe). Credit cards back up this arsenal of currencies. 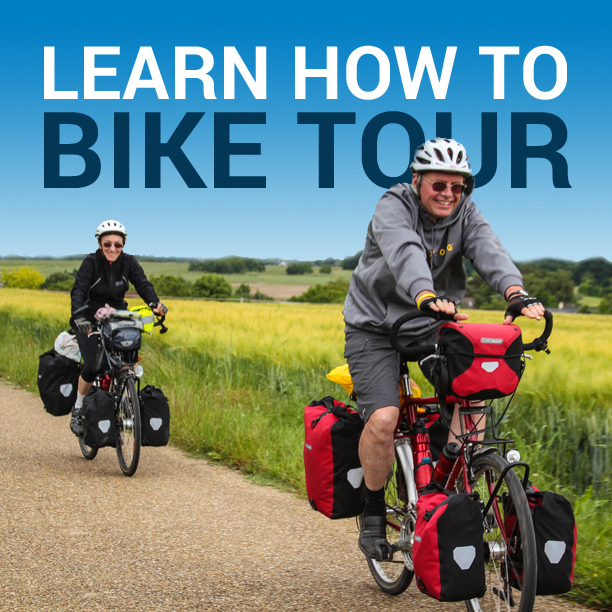 Spare Screws – On almost any fully-loaded touring bike is a set of front and rear racks that hold the panniers to the bicycle. These racks use a set of screws to stay in place and sometimes, these screws come loose while you’re out on the road. Because this has happened to me on previous tours, I always carry a couple extra screws on my bike, just for this instance. If I lose a screw, it’s not a big deal because I always have a few backups on hand. On this trip, I’m carrying four extra screws. Baseball Hat – If I were more stylish I might sport a more European hat, but it’s simply not my style. On this trip I’m wearing a simple white baseball cap to cover my head and keep people from staring at my occasional helmet hair. Bike Shorts – Once April and May rolls around I hope that the weather will be warm enough to actually put on a pair of shorts. When (and if) that does actually happen, I’ll have a pair of Fox mountain bike shorts to wear. These shorts look like regular shorts you would see someone wearing at the mall, so I can wear them both on and off the bike and not immediately stand out as a cyclist. I did not bring traditional spandex bike shorts on this trip. Sleeping Bag – To stay warm at night, I’m using a North Face Cat’s Meow sleeping bag, which according to its tag, will keep me warm in temperatures as low as 20°F or –7°C. According to a BicycleTouringPro.com reader, the Cat’s Meow is now longer in production by North Face, but there are a number of similar sleeping bags in production. When packing for a winter bike tour, you want a bag that will keep you warm at night, but the bag should also fit inside one of your rear panniers. If it doesn’t fit inside one of your rear panniers, it’s probably too big (Or your panniers are too small)! Down Jacket – For just the same reason that I brought two pairs of shoes, I’ve also packed an additional jacket. This third jacket is a reversible down jacket made by a company called “Ground”. I’ve never heard of the company before, but I got an incredible deal on the jacket, so I bought it. It’s warm and I usually just wear it when I’m inside and off the bike. Duffel Bag – In order to get my four panniers and everything inside those panniers to the airport, and then to my apartment in Luzern where I started my winter bike tour through Europe, I used a large duffel bag purchased from my local Target store. The bag is big enough to fit all my things inside of it, but it’s thin enough that it can fold down and fit inside one of my panniers. To see how I used this duffel bag to get my things from California to Switzerland, make sure you watch my video, “Packing For The Plane. Getting Your Gear To The Start“. Briefcase/Pannier – Again, I knew I’d be doing a lot of walking on this trip and I wanted to have a bag to walk around with that wouldn’t immediately call me out as a traveling cyclist. For this reason, I decided to bring my Lone Peak pannier briefcase. The bag looks like a normal laptop bag, but it also attaches to the racks on your bicycle, so you can use it both on and off the bike. Passport – Anyone traveling overseas needs a passport. Get it early and keep it safe. I don’t know what happens if you lose it… and I don’t want to find out! Wallet – On previous trips I’ve simply put a rubber band around my credit cards and cash and called it a day, but on this trip I’m using a Buxton zippered travel wallet to keep my credit cards, money, and ID in order. Lip Balm – Always within close reach is a tube of lip balm. You might not need this, but I think it’s nice when the weather gets cold and dry. Thin Gloves – In addition to the heavy snow gloves that I wear when on the bicycle, I’ve also packed a smaller, lighter pair of Burton gloves. These are the gloves I walk around town in. They’re easy to pack down and they slip on and off the hand with ease. Food – Inside my panniers I am also carrying a small amount of food. I usually don’t have more than three days worth of food on me at any one time because food is so easy to come by here in Europe. If I were traveling in another part of the world, I might need to make a larger food allowance. That being said, I’ve got so much stuff with me on this trip that I really don’t have a lot of room to carry much food. I usually like to have at least half a pannier set aside just for the storage of food, but it isn’t happening on this trip. I’ve broken my own rule (which just goes to show that any rule can be broken)! Mini Tripod – Traveling alone means that I don’t get any photos of myself unless I ask a stranger to take the photo of if I set the camera up on a tripod and take the photo via the camera’s timer. To do the later, I use a small mini tripod like the one found here. It’s lightweight and a huge help when setting the camera up for self-portraits. Camera Clamp– For more complicated photo ops, I use a Pedco UltraClamp to attach my digital camera to street signs, tree branches, fence posts, and even my bicycle’s handlebars. In many cases, the mini tripod just doesn’t cut it, so this camera clamp saves the day when you gotta get “the shot”. The clamp is heavy, but rugged. If you are bringing a camera with you and you care what your photos look like, I think this product is worth carrying. GPS – To navigate around Europe (and do a bit of Geocaching along the way) I’m using an inexpensive Garmin Etrex Legend GPS Receiver. The GPS was a huge help to my navigation efforts on my last trip to Europe, but on this trip the GPS has been completely useless thus far. The clouds have been so thick since arriving here in Switzerland that I’ve been unable to get a signal to the receiver. Again, when April and May roll around, hopefully the sun peaks its head through the clouds and the GPS will become useful again. But until then, I have a feeling I’m stuck navigating the old fashioned way – with maps. Digital Camera – To document my trip, I’m using a Canon Powershot SD1100. It’s an 8 Megapixel camera that uses an SD card and a lithium battery. I purchased an extra lithium battery for the camera, but seem to have misplaced it. That being said, I think it is important to have an extra battery for your camera because when you are out on the road and your battery dies, it’s almost impossible to find a place to stop and charge your battery until you are done riding for the day. And even then it can be difficult at times to find a power source for your camera. It’s best if you just carry an extra battery so you can make sure you don’t miss that once-in-a-lifetime shot. Memory Cards – My digital camera stores its photos on SD cards and I’m carrying three SD cards with me on this trip. I have one 4 GB SD Card and two 2GB SD cards to serve as backups. When the cards get close to full, I back them up onto my computer and/or my external hard drive. Digital Camera Battery Charger – Because my camera uses a lithium battery, I have to bring a special battery charger just for the camera. Luckily, the Canon Powershot SD1000 comes with an extremely small battery charger. Actually, the small battery charger is one of the main reasons I bought this camera in the first place. Space and weight is important for any traveling cyclist… and this battery charger is both small and light! Earphones – While I’m not traveling with an iPod or any other sort of MP3 player, I do have my laptop computer with me and I use the Sony earphones I’ve packed for this trip when listening to music and when talking with friends and family via Skype. Clip-on LED light – In addition to the bike light attached to the back of my bicycle, I’m also carrying a small LED light which operates on a watch battery and clips to clothing or any small external flap. I brought it along for this trip because it’s lightweight and will help to draw attention to me when the weather gets bad and visibility drops out on the roads. Pens – Inside my pannier/briefcase I have 4 pens and 2 pencils. I use these items to write in my journal, map out my daily routes and list out items I want to add to my shopping list. Microphone – I’m using Skype and a low cost Skype subscription to make inexpensive international phone calls to various people around the world. To make these calls, I don’t necessarily need an external microphone (because my laptop has a built in mic), but the external mic certainly adds to the clarity of my calls. And because I’m doing business while I’m traveling, I felt it important to make my phone calls as clear as possible. For this reason, I’m carrying a simple external mic for my computer. Thank You Notes – When I meet people who help me on my travels, I like to leave them a little thank you note. I think it’s a nice way to say goodbye and it leaves a good impression on those you meet along the way. I started this trip with about 18 simple thank you notes and matching envelopes. Reading Books – There is usually a lot of spare time on most bicycle tours… and for this reason, I recommend bringing a reading book or two. On this trip I have one book in German (because I’m trying to learn German while I’m here) and one book in English. I will either donate the books to a library once I am finished, or simply throw them away. Journal – In addition to the books I’m carrying, I’m also writing in a journal. Inside my journal I document what I accomplish on a day to day basis, but more importantly, I use my journal to plan out my actions for the future. Click here to read more about using a journal on your bicycle tour. Laptop Computer & Charger – The most expensive and most important piece of equipment I’ve brought on this trip is my laptop computer. I’m working while I travel, so my laptop is vital to my operations here. This website and dozens of other sites I manage through my business at Silver Mountain Marketing would fall into the Google sandbox if I did not have this computer with me. I’m using a Sony Vaio VGN-CR220E and it’s about one year old. If you want to get me a new computer (PC or Mac), I’d be more than happy to accept. Laptop Sleeve– To keep my computer safe when traveling, I’m using an REI E-Wrap Computer Sleeve to pad and protect my laptop inside my panniers. Flip Mino HD Video Camera – And finally, I didn’t mention this in the video above, because I was actually using this item to produce the video, but I’ve brought a Flip Mino HD video camera with me and am using this item to produce all of the videos you see on this site. The camera records with 1280 x 720 pixels, which qualifies it as high definition. That being said, the quality is nowhere near that of higher quality high definition cameras. But for the traveling cyclist, it’s a great little camera to document your adventure. This entry was posted in Bicycle Touring Pro Articles, Bicycles, Clothing, Featured Articles, Featured How-To Articles, Main Articles, Panniers, Planning, Products, Videos and tagged bicycle touring in the snow, bike friday extreme, cycling in the snow, detailed packing list, european bicycle tour, extreme cycling in the winter, snow cycling, what to pack for riding in the snow, winter bicycle tour, winter bike tour, winter folding bicycles. That camera stole my name! I’ve been Mino for a lot longer than it has. Just as an warning to add to the very useful article above, be aware that in a lot of places (UK and much of Europe for example) it is illegal to carry a knife (or knives above a certain size). So, stating the obvious, research the laws of your destination before you go! PS: Careful with those PNY 8GB USB sticks – I bought two last year and one has stopped working already, losing me some important data! – Agree with Simon – I would leave that big knife at home. In many EU countries you would spend the night in jail and get the boot from that country if they find than on you. That knife is over 3″ long and has a locking blade and is not OK for the UK. The drop point of that model does not make a case for it being carried as a utility knife. KABAR is a militaty knife. You are asking for problems with a knife like this. In western europe it is difficult for criminals to aquire hand guns. Knife crime is a serious problem and the cops can do random searches for weapons such as this. I don’t want to comment on the self defense aspects of a combat knife, but the only merrit to having a knife like that is thinking you are safer. Statistically it is the certainly the opposite. stick with a Swiss Army knife Climber model. If you have to fight a wild bear use a tent peg!